The bed is often one of the most loved furnishings in a home. When it’s nearing the end of a hard day’s work, most people dream about lying down on their beds. This piece of furniture provides comfort and relaxation. What adds to the comfort of a bed is the bedding and bedspreads. Some bedspreads are called coverlets or quilts. 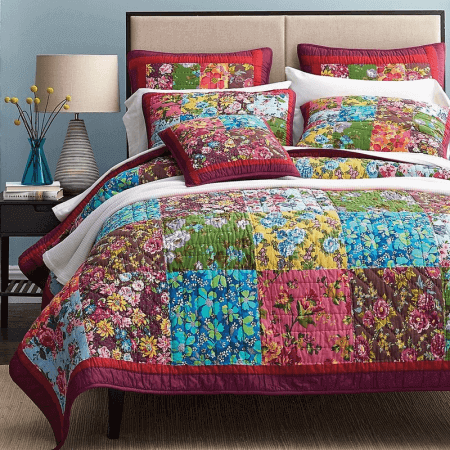 What are coverlets and quilts and how are they differentiated? Read on and understand their differences. A coverlet is a lightweight bedspread likened to a thin blanket. It is designed to cover the bed and has overhanging sides. It has been used as a bed cover in the US since the colonial times. Coverlets can be made of either thin or heavy cloth. They are usually woven or quilted and have a very thin layer of padding. Coverlets often have one consistent design or color throughout the entire fabric. They are considered to be a decorative layer. Most of the time, coverlets come with a pair of matching pillow shams. A quilt is a thicker bedspread often used during the colder seasons. It is usually made up of several pieces of cloth that are stitched together. Quilts normally have three layers: a woven cloth top, a thick layer of padding, and a woven back. The patchwork of smaller pieces of fabric that often comprises the top layer makes quilts very colorful. The varied patterns used in making quilts add to their uniqueness. Quilts have also been part of several family traditions. Some people prepare them as gifts for special occasions like birthdays, graduations, and marriage. Over the years, quilts have been used for varied purposes aside from bedding. They are now also used as table runners, tablecloths, or wall hangings. 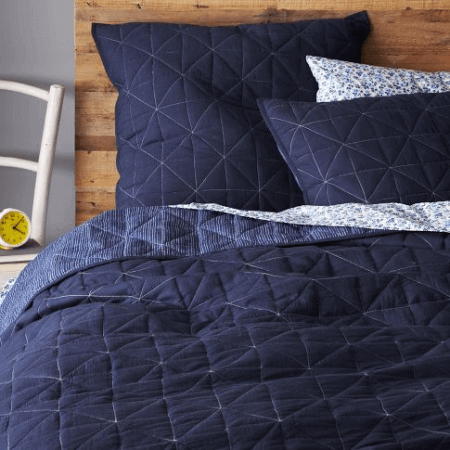 What is the difference between a coverlet and a quilt? A coverlet is made of either light or heavy fabric and has a very thin layer of padding. A quilt, on the other hand, is made up of three layers – two of loose fabric and thicker padding in between. The coverlet’s design is usually consistent throughout the cloth while a quilt is characterized by a patchwork of different designs from smaller pieces of fabric. Coverlets are primarily used as bed covers/decorations but quilts have other functions such as a table or wall decoration. The size of coverlets are consistent – just big enough to cover the bed with overhanging sides. Quilts can come in a wide variety of sizes.